Figure this one was due since it’s currently knocking my and everyone else’s socks off in my main garden bed right now. I see a few more people growing it every year, but still, it’s not one of those perennials I would call widely popular. It should be. First, it’s a mid- to late-season bloomer. A ton of flowers like to burn up the joint in June and July, sure, but what exactly do we have capable of headlining the show the first two weeks of August? Not enough, at least in my garden. Depending on variety, Balloon Flower blooms from the second half of July through most of August, probably the most notoriously un-colorful stretch of the northern season, from a perennial standpoint. The common Balloon Flower blooms a stunning, classy, regal violet blue, star-shaped flowers held high (36″) and assured above thin, finely-leaved stems. It’s a very aristocratic-looking plant. There is a white, ‘Albus,’ and a pink, the very pretty ‘Fuji Pink,’ which comes up a bit shorter. There are numerous other varieties as well, some featuring double blooms, because you know the nursery industry couldn’t keep their hands off something so perfect. Balloon Flower is very easy to grow, preferring a slightly acidic soil with decent drainage. This is one of those plants many books list as full-sun that does beautifully in my part-sun front bed (four hours of direct sunlight, high shade rest of the day). They like to be kept moist, but I don’t water Balloon Flower any more than I do, say, tall phlox, so I do sense some tolerance of dry conditions. 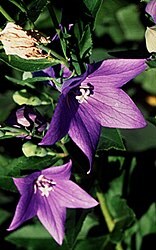 Balloon Flowers have a very fleshy root system, and do not like to be disturbed. I like to plant them near the front to middle of the bed; too far back, and you don’t appreciate how classy the stems and leaves are. Most books point out that if you do lift and divide them, they won’t bloom for up to two years. I lifted and divided mine several times, and all divisions bloom heartily the following year, but what do I know. I like BF as a specimen plant, that is, a clump by itself, for accent. It just doesn’t lend itself to massing, or planting in waves. I don’t know. You try it the way you want. But I like it lean. I look at Balloon Flower in my garden and am reminded of Audrey Hepburn, by herself in the rain, in that scene at the end of Breakfast at Tiffany’s. Balloon Flower combines well with daylilies (grow a later-blooming yellow or gold daylily with BF), and just about everything that’s blooming in the same period, especially tall phlox. My BF sits in front of the tall pink phlox blooming right now, and the combination is pretty darn perfect, covering all the bases, color, contrasting forms, nice contrast in bloom size, you name it. Best of all, BF is hardy as granite. Zone 3 is a snap, as is Zone 2. Balloon flower is slow to emerge in the spring, so mark it in the fall or you’ll forget exactly where it is.